FILE - Afghan refugee women sit with their babies as they wait with others to be repatriated to Afghanistan, at the United Nations High Commissioner for Refugees (UNHCR) office on the outskirts of Peshawar, Feb. 2, 2015. FILE - U.N. High Commissioner for Refugees Filippo Grandi talks to an Afghan refugee woman during his visit to the UNHCR's Repatriation Center in Peshawar, Pakistan, June 23, 2016. “Rather than saying something, speak out publicly when this concerted campaign by Pakistan began, UNHCR in Pakistan remained silent and in fact increased its cash grant to the refugees all of which facilitated the return of hundreds of thousands of people in conditions that cannot be called voluntary." 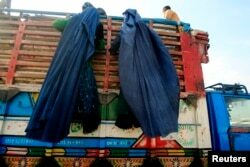 FILE - Afghan refugee women, clad in a burqa, climb on a truck to be repatriated to Afghanistan, at the United Nations High Commissioner for Refugees (UNHCR) office on the outskirts of Peshawar, Feb. 13, 2015. 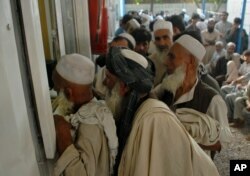 FILE - Afghan refugees living in Pakistan wait to get their documents to travel back to Afghanistan, at the UNHCR's Repatriation Center, in Peshawar, Pakistan, Sept. 7, 2016.